The article refers to Kaspersky Security Cloud for Mac — Family and Kaspersky Security Cloud for Mac — Personal. With Kaspersky Security Cloud for Mac, you can block unauthorized access to your web camera for applications. Open the preferences window of Kaspersky Security Cloud for Mac. For the guide on opening the application preferences, please refer to this article. 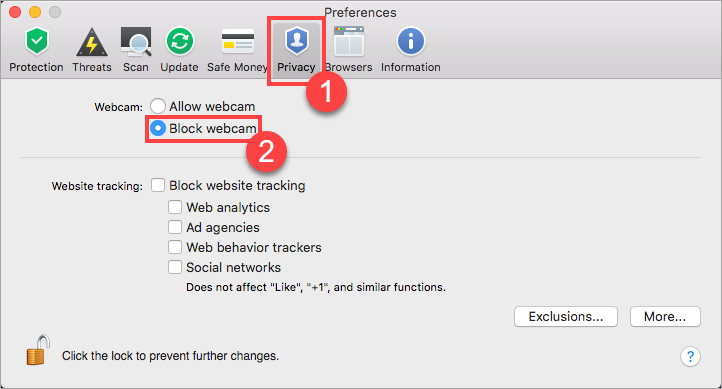 Kaspersky Security Cloud for Mac blocks new requests on accessing your web camera. To block access for the applications which are currently running on your computer, please restart these applications or restart your Mac.